Despite growing up in a city outside Detroit, Julie Auger innately yearned for the smell of rich soil sprinkled with pine needles and breeze swept fields laughing in wildflowers. 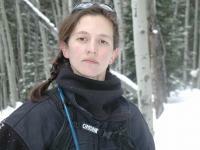 She earned her bachelors of environmental science and biology from Florida International University, and then spent nearly thirteen years working with the USFS and USFWS. An interest in the integration of natural systems and human systems led her pursue her Master’s degree in Saybrook University’s organizational systems program. It is now her purpose to lead and support transformation in service to the planet. Julie spent several years as a managing partner in a boutique-consulting firm before emerging as an independent transformational change leader. She consults and facilities both large and small scale organizational and community initiatives. In partnership with the Powers of Place Initiative, Julie is currently exploring the concept of leaders as place-makers and the use of stories as vessels to create language and bring awareness to the aliveness that flows out of place. Julie also mentors ‘challenged’ teenagers in a program called Mountain Mentors and volunteers with Toledo Grows Community Gardens, Toledo Choose Local, and The Old West End Bike Co-op. She loves living her life outdoors, partnering with nature, traveling, and celebrating the people in her life.